I’m a busy mama and I spend way too much time thinking about food. After a crazy busy day I hate coming home and having to think about what I can possibly throw together for dinner. Way too often I end up turning to total junk because it’s fast. Thankfully I found a convenient and healthy meal that’s simple to make and it actually tastes good! Seriously, y’all, this southwestern salad and potato bake is absolutely delicious and takes like 5 minutes after a busy day! 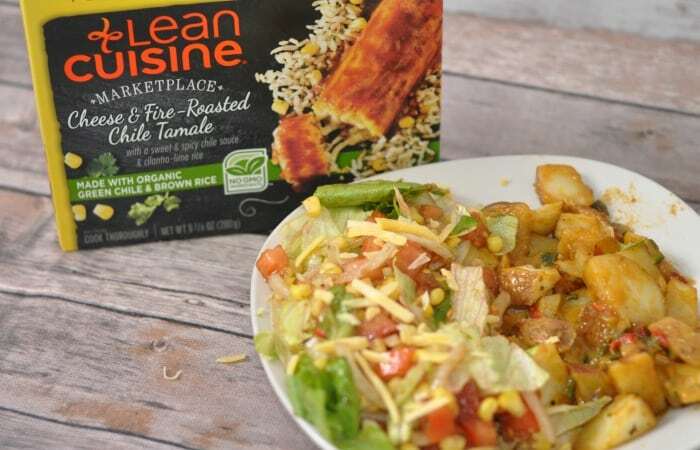 The absolute star of my southwestern salad and potato bake is the awesome LEAN CUISINE® MARKETPLACE Southwest – Style Potato Bake. I love to use Lean Cuisine meals as a starter for my dinners because they’re so quick and healthy, plus they’re super tasty. Lean Cuisine has come up with some new limited time varieties to help us with our menu fatigue. The limited time flavors are super trendy with delicious flavor, organic ingredient options, and gluten-free options. 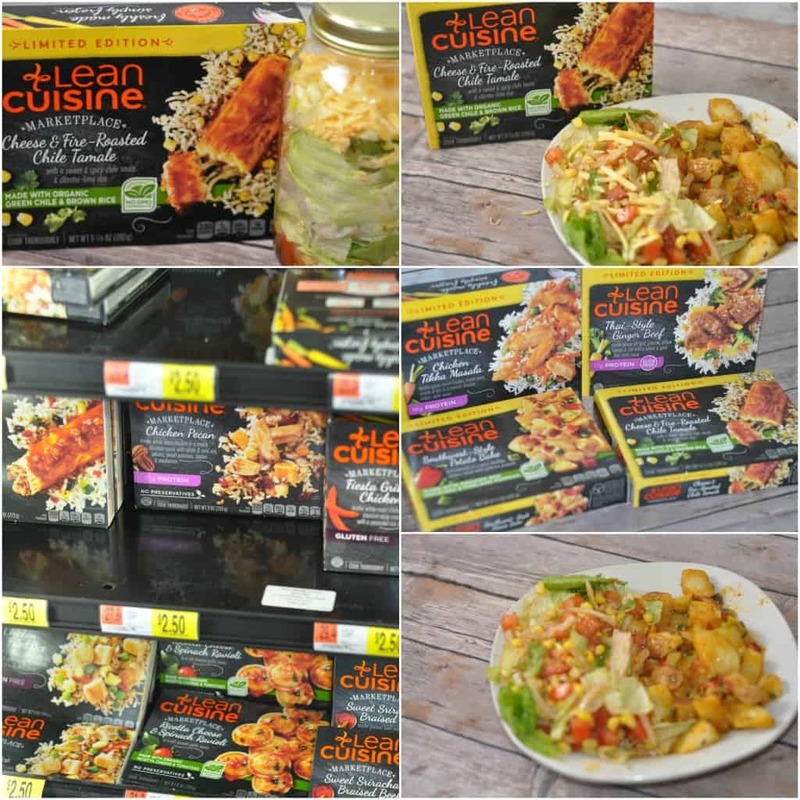 Lean Cuisine is really a modern eating partner delivering contemporary cuisine and health. Of course the Lean Cuisine meals are delicious, but I love adding a fun complimentary side item to create a more full meal. One of my favorite things to add is my easy southwestern style. It pairs perfectly with the Lean Cuisine Southwest Style Potato Bake (though you could totally pair it with the LEAN CUISINE® MARKETPLACE Cheese & Fire-Roasted Chile Tamale as well), The southwestern salad and potato bake is my go-to dinner for busy school days because it’s just so full of flavor! Oh, and it helps that with the low everyday prices at Walmart let me stock up on Lean Cuisines and everything else I need! One of my favorite things about the southwestern salad and potato bake dinner is that you can pre-make your salad, so you can put this meal together in just a few minutes when life gets busy. Because let’s be real, when is life not busy? The salad is made in a mason jar, so you can easily pre-make it and pop it in the fridge until you’re ready to eat it. Make a few on Sunday and set yourself up for the entire week! 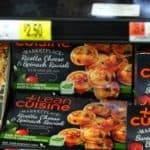 So make sure you grab a few of the limited time flavors from Lean Cuisine at Walmart while they’re still here! For more great ideas, check out the Nestlé Flavorful Moments Pinterest Board. 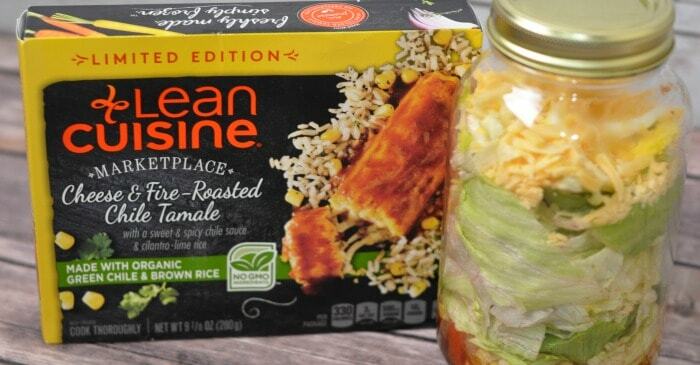 You can also check out Lean Cuisine on Facebook or on Twitter as @LeanCuisine or Instagram as @LeanCuisine! Mix Salsa, Vinegar, and Olive Oil to make Dressing and Put in Bottom of Mason Jar. Layer Tomatoes, Onion, Corn, Lettuce, Egg, and Cheese in Mason Jar (in order). Refridgerate until ready to prepare. Microwave Lean Cuisine Southwest Style Potato Bake. Pair with Mason Jar Salad.